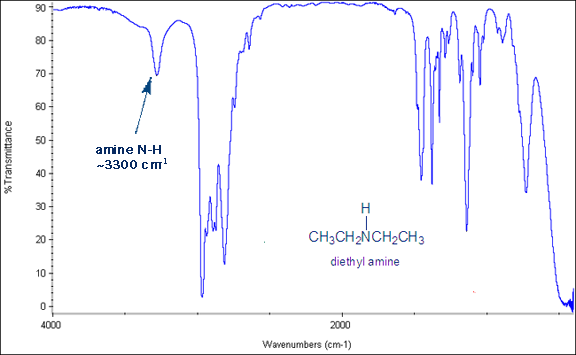 Infrared absorbance spectroscopy (IR) is a structure elucidation technique: it tells you some information about the chemical structure of a molecule. Specifically, it tells you what functional groups are present or absent in a molecule. IR measures the energy associated with different bond stretches. Energies are measured in reciprocal centimeters (cm-1), also called wave numbers . These stretches are shown as peaks on an IR spectrum. For example, the C=O bond stretch gives sharp, distinctive peak around 1700 cm-1. If you see this peak on your IR that means you have a carbonyl bond in your molecule. If you don’t see this peak that means your molecule does not have a carbonyl group. A carbonyl is anything with a carbon-oxygen double bond- ketones, aldehydes, esters, amides, carboxylic acids etc. To be honest, IR really isn’t that useful compared with other structure elucidation techniques. When I worked in the laboratory I rarely used IR. This is because other techniques tell you the same information as IR- which functional groups are present in the molecule- only are more exact and therefore much more useful. Your lab textbook lists many important IR peaks. But in reality there are only two peaks that you really have to know. 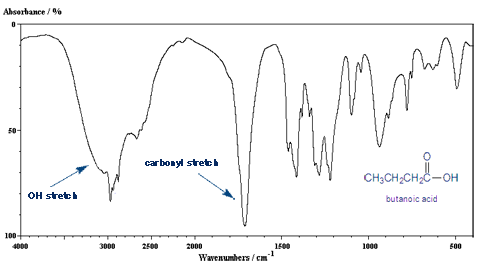 One such peak I already showed- the carbonyl stretch, which gives a sharp peak around 1700 cm-1. The O-H Stretch: Broad Peak at 3,300 cm-1. The other important IR peak is the O-H stretch, which gives a medium, broad peak around 3,300 cm-1. So What Would the IR of a Carboxylic Acid Look Like? A carboxylic acid group contains both a carbon-oxygen double bond and a oxygen-hydrogen bond. So you would expect it to have both of these IR peaks. The C=O and O-H bond stretches are by far the most important. But here are some other important IR points.. The carbon-hydrogen bond stretch is around 3,000 cm-1. If it’s a single bonded (sp3) carbon, it’s below 3,000 cm-1 (around 2,950 cm-1). If it’s a double bonded (sp2) carbon it’s above 3,000 cm-1 (around 3,050 cm-1). 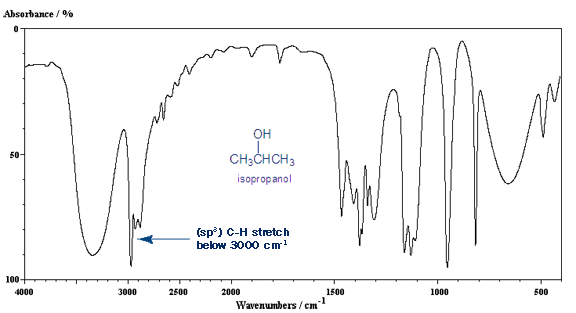 A triple bonded (sp) carbon gives a C-H stretch around 3,300 cm-1. Another good one to know- it occurs near the O-H stretch (~3,300 cm-1), but sharp instead of broad, and not as intense. 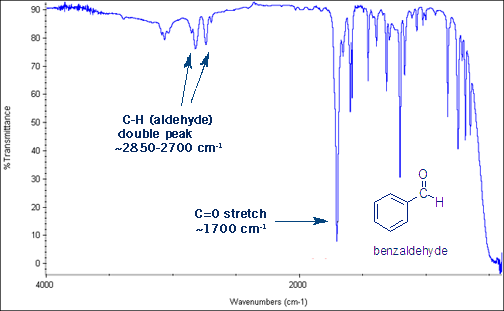 One last useful stretch to learn- aldehydes give a distinctive set of two peaks around 2,850 to 2,700 cm-1. This is the aldehyde C-H bond stretch. 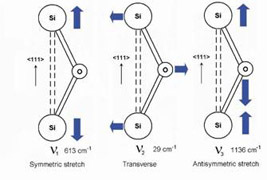 It’s a good idea to understand some general trends in stretch frequencies. Triple bonds have higher frequencies than double bonds, which have higher frequencies than single bonds. As an example, the C-O single bond stretch occurs at a lower frequency (~1,100 cm-1) than the C=O double bond stretch (~1,700 cm-1). As you increase the dipole moment the bond stretch frequency increases. For example, the C-C single bond stretch occurs around ~1,000 cm-1. 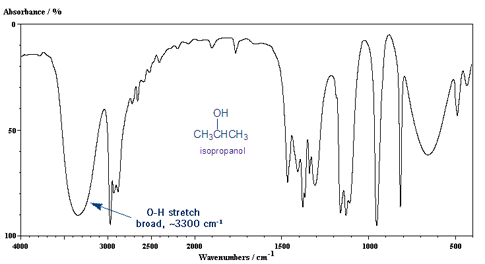 The C-O single bond stretch (more polar) occurs around ~1,100 cm-1. The region of an IR spectrum between 1500 and 600 cm-1 is unique for every molecule, so it’s called the fingerprint region. So if you wanted to check to see if two molecules are identical you can compare their fingerprint regions- they should match. There’s no real procedure this week. Your TA will show you how to do an IR, although it’s unlikely you’ll ever run one yourself in an undergraduate orgo lab. 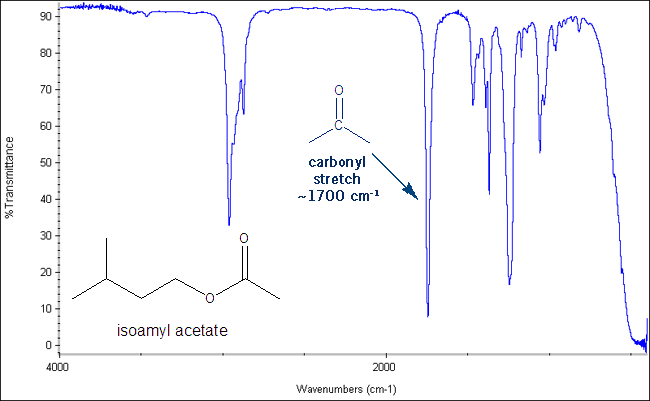 You’ll probably have an IR structure identification worksheet to complete- you’ll have to match molecules with their corresponding IR spectra.